If you browse CNN's website, you will notice that stories from Australia, New Zealand and other nations in the Pacific Ocean are published under the section Asia. 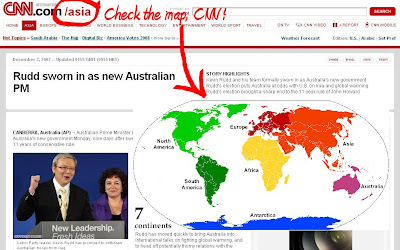 CNN.com is the only website I know of that lumps Australia and Pacific nations under Asia. Other news websites, such as BBC News, will publish news about Australia under a section called Asia-Pacific instead. It makes you question CNN's commitment to responsible, accurate and factual reporting.